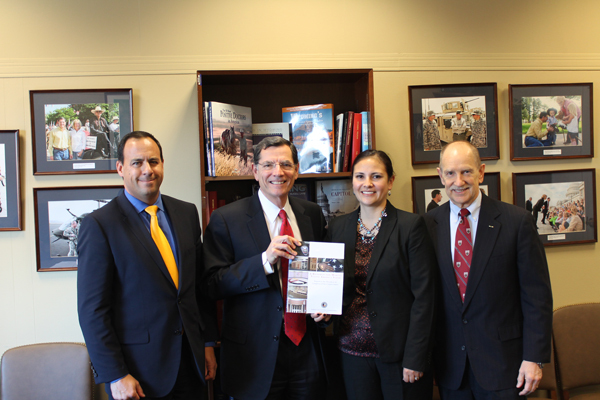 Members of the Commission presenting the ILOC report with the Vice Chair of the Senate Committee on Indian Affairs, US Senator John Barrasso (R-WY). Left to right: Chairman Troy Eid, Senator Barrasso, Commissioner Affie Ellis, Commissioner Tom Gede. Photo courtesy of Troy Eid. Would tribal law enforcement jurisdiction help address the social and cultural problems in rural Alaska? It has been debated for decades, and now a congressionally-mandated panel says it’s the only way to go. But, a Supreme Court ruling says there is no Indian country in most of the state. LIVE Broadcast: Tuesday, November 19, 2013 at 10:00 a.m. on APRN stations statewide.